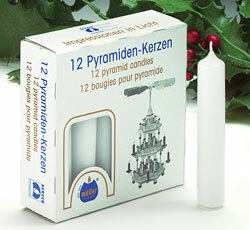 These Pyramid / Carousel candles are 5/8 inch diameter by 3-3/4 inches high. The box includes 12 candles. Please make sure that you are ordering the correct size for your carousel. You will be responsible for return shipping cost if they are not the correct size. Some German carousel candle holders are 1/2 inch diameter, if you need this size please go to our chime candle page. On the chime candle page you will find 1/2 inch diameter candles in assorted colors. We offer the 1/2 inch diameter candles in white, red, and green. As with all candles, please trim the wick of your candle before lighting. If you were to light the wick, without trimming your carousel / pyramid candles, you would have a very high dangerous flame. Please note: These carousel / pyramid candles are not scented, but because we are a scented candle manufacturing company every product we ship out of our warehouse will leave our shop with some type of aroma. There is no possible way that we can ship products that will not carry with them certain aromas. 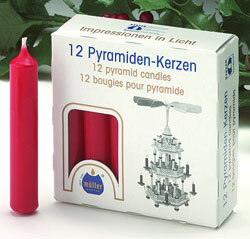 These 5/8 inch diameter German Carousel / Pyramid Candles are made in Germany. Please check the size of your candle holder carefully. You will be responsible for all return charges. These candles are 5/8 inch in diameter and 3-3/4 inches in height.